There are varying accounts of exactly when the Tukulor Empire reigned but the consensus is that it was in the second half of the 19th century. 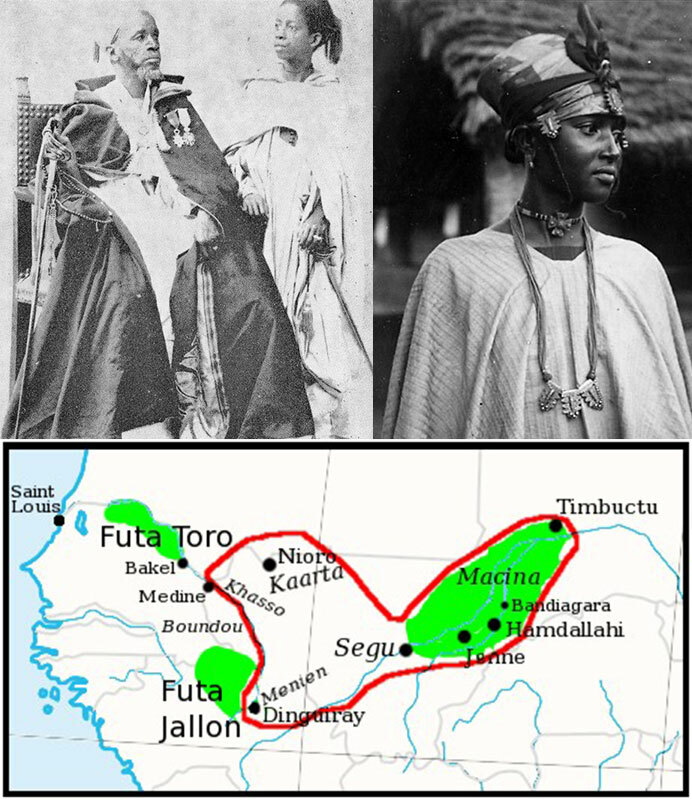 The Tukulor Empire was founded by Shaykh El-Hadj Umar Tall who was from Futa Toro (present day northern Senegal). El-Hadj Umar descended from the Fulani and his father, Thierno Saidu studied at Pir Sanikhor, an esteemed Islamic university. Saidu was a farmer, educator and family man whose three sons became saints and his son, El-Hadj Umar who became a khalifa. El-Hadj Umar’s mother, Soxna Adama Aise was a pious and honorable woman who was highly regarded in the community. El-Hadj Umar also attended Pir Sanikhor and had several teachers. He was given the role of khalifa by Sidi Muhammad al-Ghali, a distinguished student of Shaykh Ahmad Tijani in Medina of Arabia after making the pilgrimage to Mecca in 1827 and spending three years with Sidi al-Ghali. After traveling through the Middle East, El-Hadj Umar arrived in the Sokoto Caliphate of West Africa where he was welcomed by Sultan Muhammad Bello who later gave his daughter Maryam in marriage to El-Hadj Umar. In 1837 Sultan Bello passed away and Shaykh Umar’s wife, Maryam died a year later. Shaykh Umar re-married Aisha, daughter of Thierno Muhammad Nema, a judge from Sokoto. Shaykh Umar spent a lot of time traveling through West Africa and settled in Fouta Djallon founding the town of Dingiray on the border. He had several disciples and a year after being attacked by non-Muslim leaders, Shaykh Umar embarked on the conquest forming the Tukulor Empire around 1851, first overtaking the Bambara in the north, then the Kingdom of Kaarta. Soon thereafter, the Tukulor Empire covered the Kingdom of Segu, the state of Macina and Timbuktu. Shaykh Umar died in battle in 1864 but his son Ahmad maintained the empire until the French defeated and disbanded it about two decades later. Today, the Tukulor people are most concentrated in northern Senegal and parts of Mauritania and Mali. Tukulor speak Fulani and are a mixture of the Fulani, Wolof and Serer people. Madina Ly-Tall, Un Islam Militant en Afrique de l’Ouest au XIXe Siècle: La Tijaniyya de Saiku Umar Futiyu contre les Pouvoirs traditionnels et la Puissance coloniale (Paris, 1991).